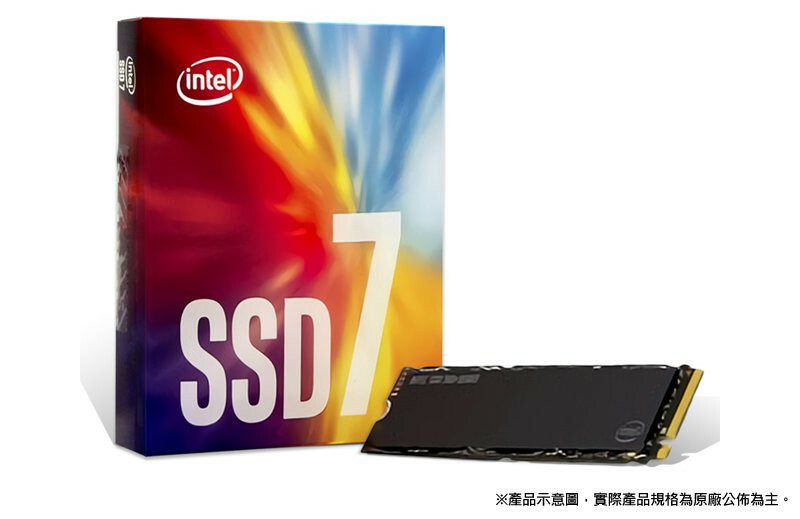 Autobuy, a popular online shopping site in Taiwan, recently listed Intel's upcoming 760p and 660p M.2 NVMe SSDs on their store. 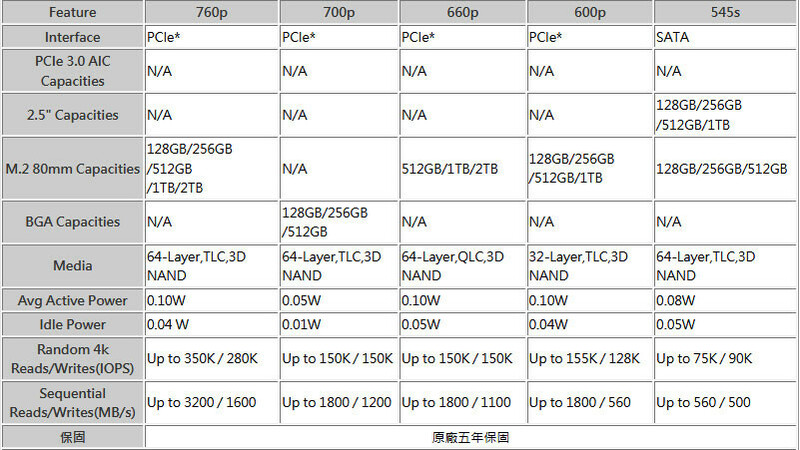 The SSD 760p will be manufactured under Intel's 64-layer 3D NAND technology and feature TLC (triple-level-cell) NAND. It's obviously the faster of the two with a sequential read speed up to 3,200 MB/s and a write speed up to 1,600 MB/s. The drive offers random access reads up to 350,000 IOPS and writes up to 280,000 IOPS. Intel will offer this model in capacities of 128 GB, 256 GB, 512 GB, 1 TB, and 2 TB. 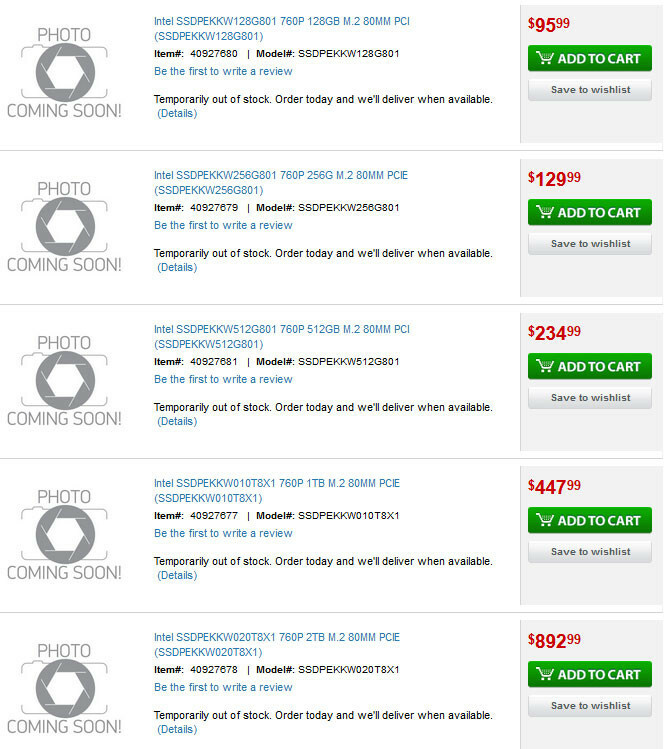 TigerDirect listed the pricing for them at $96, $120, $240, $448, and $893, respectively. The SSD 660p is Intel's budget-friendly this time around. Therefore, it will use QLC (quad-level-cell) NAND despite being manufactured with the same technology as its older brother. This SSD can reach up to 1,800 MB/s in sequential read and up to 1,200 MB/s in sequential write speeds with random access read and write performance in the range of 150,000 IOPS. Surprisingly, Intel won't be offering this model in the 128 GB and 256 GB capacities. Instead, the lowest capacity model will start from 512 GB and make its way up to 2 TB. Unfortunately, pricing wasn't available at the time of this article. Looking at how disappointing TLC based SSD from Intel was(like their recent CPUs), we should have low hopes for QLC based SSD. Also Intel will price these just because of their "brand" rather than on how appealingly they perform. Rough prices converted to US$ including 5% sales tax/VAT. No sign of the larger capacities yet. As a point of reference, a 256GB 600p retails for around $115 in Taiwan. In other words, you get a lot of extra performance for $2 more. 760p range could beat out the 960's for price/performance if its prices stay low and the 660p could be an awesome budget nvme drive series! 600p is cheap in Holland, so I'm hopeful. The 760p 256GB at $120 is matching the price on the 960 EVO right now (Newegg pricing). So if that price holds, sounds like a good price. Is this the first commercially announced QLC drive? Didn't expect that from Intel. Still, I welcome the arrival of cheaper high-capacity flash storage with open arms. If sustained performance is similar to fast SATA drives but with better 4k random performance and sequential bursts, that'd be plenty for me. Don't need several GB/s transfers over any amount of time, seeing as I don't run a server farm. The 545s is generally regarded as an excellent SATA SSD. The 600p got the triple whammy of IMFT's slow 32-layer flash, a bad controller, and really poor firmware. I seriously doubt that will happen a second time. Of course, it wouldn't be the first time, and Intel's track record for SSDs in recent years is... bad. But they used to be great, and the 545s could be seen as a sign of improvement on their part. after the 600p fiasco (new firmware destroying your write speeds with no way to reversing it), plus all the scandals and bad ethics, I'm not buying a f*****g AA battery from intel anymore.